MY HAND LUGGAGE AND TRAVEL ESSENTIALS WITH MIA TUI. For someone who travels a fair bit, it's taken me a while to get a bag that it suitable for weekends away/days out that doesn't involve wheels. I don't mean hand luggage suitcases because I just bought a gorgeous purple one that makes me feel like Daphne from Scooby Doo, but rather a bag that fits your iPad, purse, travel docs, sleeping pillow and all that stuff that you want easy access to. 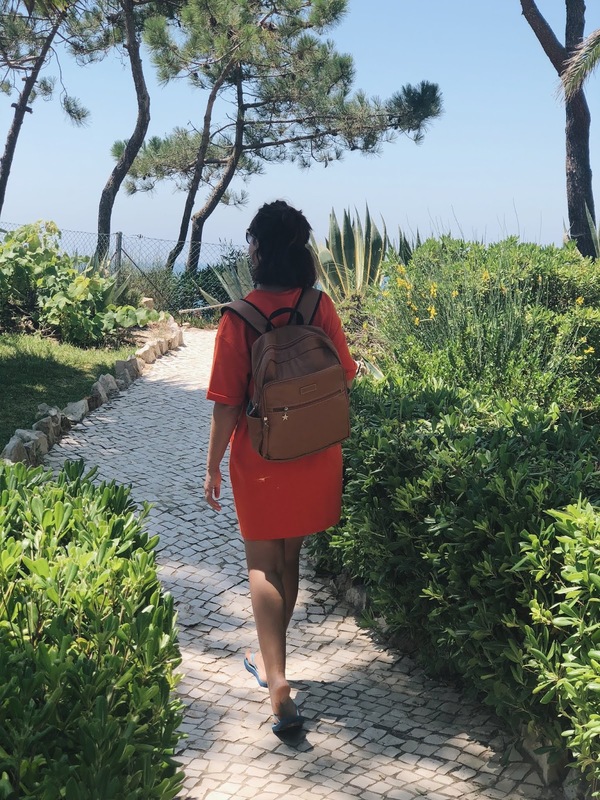 I came across Mia Tui and they kindly sent me over their Sydney backpack which has been very handy during my very recent trip to Portugal. Admittedly, I didn't quite check the size of the bag and was expecting a tiny backpack the size of an A4 sheet of paper, so when I opened the package and saw it basically spanned the length of my back I was like WOAH, look at all these compartments! This is everything I keep with me in my backpack when on a day trip/day at the beach/on the airplane/train and such. If I'm on a short-haul flight and have no entertainment system then this is always good for watching Netflix (yay for downloadable shows!) and writing up blog posts or university assignments. If you're on a long-haul flight check out my blog post on how to keep yourself entertained on a flight. If you need your laptop for work, then the Sydney backpack also has a pocket for your laptop and can fit a 13 inch Macbook perfectly. 9/10 times I forget to charge it, so then it becomes pretty useless. This is a must when I'm travelling anywhere out of Gibraltar because the chances of me using up all my battery when listening to music or using Google Maps is high. If not, I'm then the idiot who has to sit on the floor in Gatwick Airport waiting for my phone to charge. 4. A book (or two). 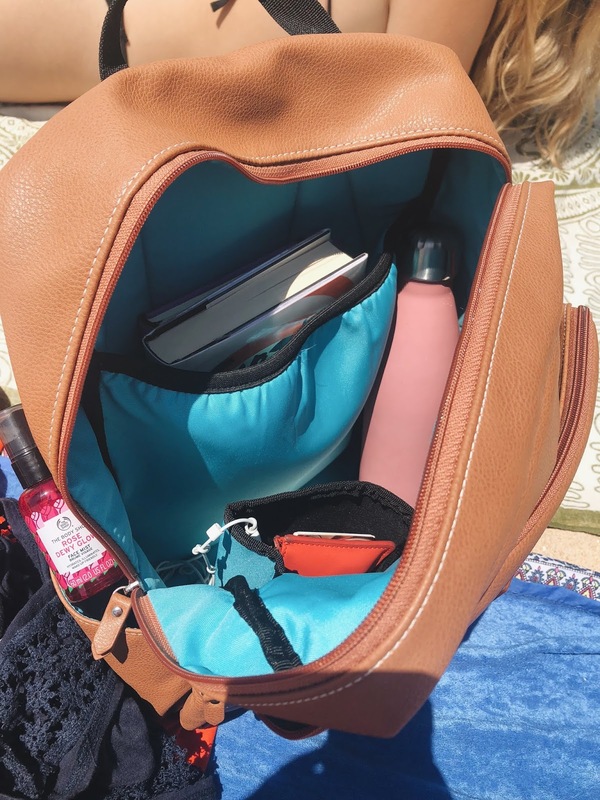 I actually packed two books with me on my trip because I knew I was going to be spending most of my trip poolside, and they weren't the lightest of books either! I wish my kindle still worked cause it's a lot more handy when travelling and takes up a lot less room, but alas the battery gave up on it and there is something I prefer about holding a real book. If you want to take a peak at what I've been reading you can see my 2018 reading list here. I bought one of these from Accessorize years ago and it comes with me everywhere! They're so handy for keeping all your important stuff in one place and not crumpled at the bottom of your bag (how can people do this!). If you have a friend who likes to travel, this would make a great gift as they have sections for your documents, passport, tickets etc. I recently bought this Clinique 3 step travel kit so that even if I'm travelling hand-luggage only I can still look after my skin. I'll be writing a summer skincare post soon so more on the products later, but a mini moisturiser like this one is always a good idea if you're flying for hours and your skin is feeling particularly meh. I bought mine at The Body Shop as they have quite a large range of facial sprays and they're all HL allowance friendly. I seem to find it very hard to spray things on my face so watching me spray this or setting spray or whatever is always rather entertaining. 10. My Journal (and pen). I usually tend to journal most when I'm flying cause I have nothing else to distract me, or use it as an opportunity to write down a random abundance of lists, like 'things to learn about when I'm bored'. I'd really like to give bullet journalling another go, and when you have free time when travelling it's always a good chance to do it. I find it hard to fall asleep when I know people can see me, especially because my mouth sometimes ends up opening when I doze off. Plus if the person next to the window doesn't want to shut it, then you can block out the light this way. 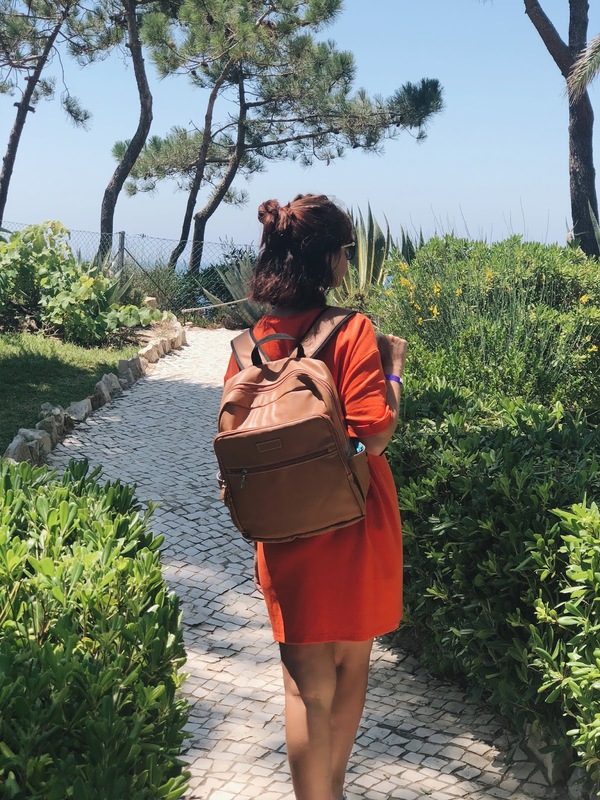 The Mia Tui Sydney Backpack is currently retailing at £45 and features two pocket compartments, an insulated bottle holder, space for your phone and pens, and also comes with a clear zip bag (which I used to keep my travel minis). The thick straps means that even if you're carrying a lot on your bag throughout the day your shoulders won't be killing. What are some of your travel essentials? Do you have any products you always carry with you? Eye mask and a portable charger would be at the top of my list. Absolute necessities. As someone who wears contact lenses or glasses I always add these to my hand luggage as I can't afford to loose them in the hold! What a fabulous looking bag this is, the size would be perfect for me and I love the colour as well.